Bernardo Bellotto, Dresden from the Left Bank of the Elbe, Below the Fortresses, 1748. Oil on canvas. 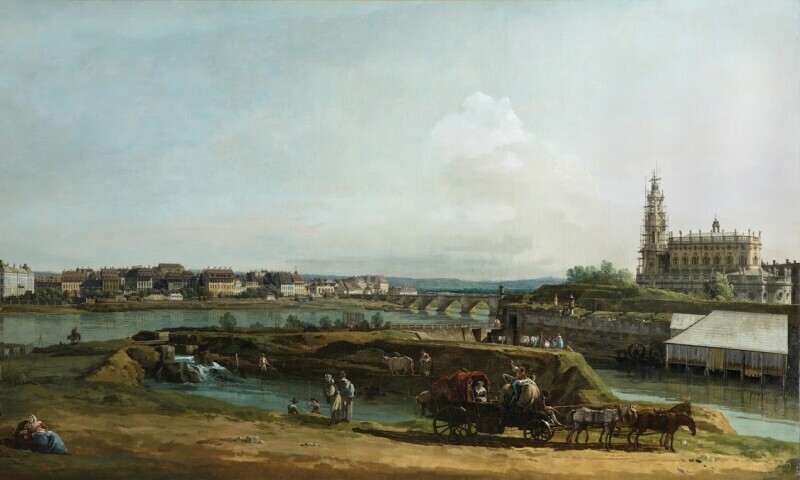 Bernardo Bellotto is recognized as one of the greatest view painters in history, acquiring his fame in mid-18th-century Dresden as the court painter for the elector of Saxony, Frederick Augustus II----who was also King Augustus III of Poland. Over the course of a decade, Bellotto produced dozens of breathtaking depictions of the city and its environs, most measuring over eight feet in width. The success and renown of these grand, comprehensive works would earn Bellotto prestigious commissions at prominent courts throughout Europe. Visitors to the exhibition will have the unique opportunity to view the majesty that was Dresden in the 1700s. One of the greatest cities of 18th-century Europe, it is only now, following its near-total destruction in the Second World War, being rebuilt to its former glory----with the aid of Bellotto's pictorial legacy.